Like any other part of our body, your hair also needs nutrition form outside as well as from inside i.e through your diet. So your daily diet must contain some hair friendly food and also your digestion system should be efficient. If you can not follow this simple rule, then all expensive shampoos and hair treatments in the world won't be effective in maintaining the color and longevity of your hair.So if you want a healthy shiny hair, take deep look into your diet and life style. Instead of focusing on specific nutrients or quantity, Ayurveda recommends combination of wholesome, natural food, as the best way of delivering variety of nutrients to your hair.The Key is to have fresh, whole, natural organic food. 1. Include lots of vegetables in your daily diet. dark leafy greens, beets, broccoli, carrots, fresh green herbs, mint , basil are excellent choice. 2. Spices like cumin, turmeric are hair friendly add some to your dishes.Spices not only offer their healing property ; they also help in transportation of the nutrients form the other foo you eat to the cells an tissues of the body. 3. Include lots of fruits in your daily diet. choose form different types of berries, citrus fruits, melons and sweet grapes.Try different fruits on different days. Soak handful of raisins in warm water for about 30 minutes an eat them regularly. 4. Coconut is revered in Ayurveda for its ability to nourish the hair scalp . Premature falling of hair or graying is associated with Pitta dosha, the heat principle in body. To balance Pitta add coconut into your dishes or drink juice of tender coconut. 5. 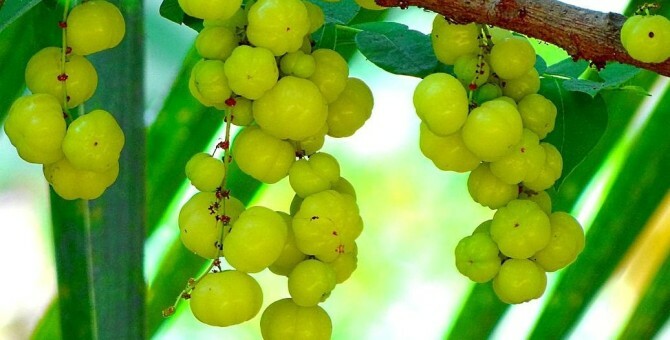 Amla or Indian Gooseberry is well known for its ability to maintain hair color and strength. 6.Add any form of dairy product into diet. Ayurveda recommends whole milk , cheese, curd or Lassi ( a drink by blending fresh yogurt and water). 7.Whole grains an legumes also offer nourishment to you hair. Mung dal(split hulled mung beans) are very nutritious and easy to digest. 8. Include nuts in your daily diet. Soak few almonds or walnut in hot water, blanch and eat with your breakfast.Soaking nut makes it easy to digest.